It’s likely you can name that first boy who you thought hung the moon. He had deep brown eyes or the latest hairstyle and stole your heart right away. Whether it was in fourth grade or junior high, the feelings of that crush were real and may have led you through an emotional roller coaster. If your daughter is starry-eyed for the first time, it’s important for parents to recognize her feelings without downplaying the crush. 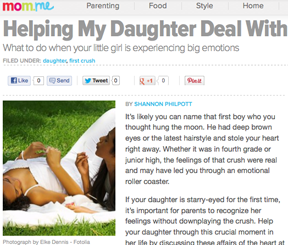 Help your daughter through this crucial moment in her life by discussing these affairs of the heart at her pace.